"Various people, too many to name. You know how it is, music is life to a moon elf. Well, most moon elves, anyway. There are exceptions, of course. You missed three notes," she said, absently before speaking as though recalling a dream. 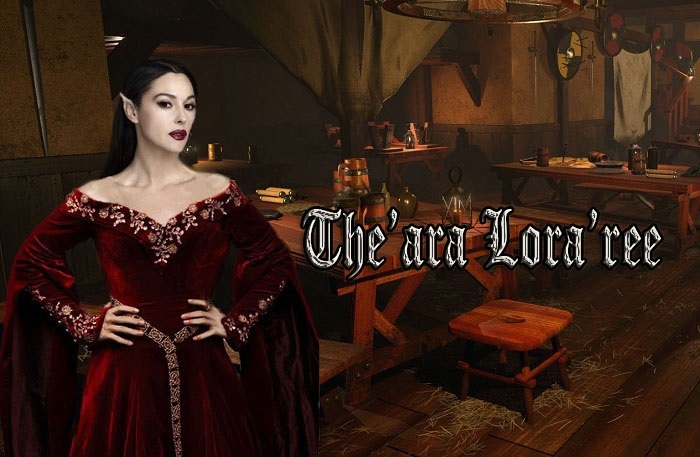 "Tei'ra Le'rra was a great influence upon me, as was Aoro'ra Cu'laine, both legends of Mione. Oh! To hear them play near the crystal caverns in winter--! It was like they called down the moon to bathe under our waterfalls. So many colors refracting light..."
She sighed. "It was... a beauty so perfect, it was like... birth and death and rebirth all occurring at the same time... It transforms you. It wraps you up in its sound like a cocoon and you emerge a butterfly, not quite the same person as you started before the concert. You're you, but... more. It seems to lead you to who you were meant to be. Something opens up inside you and you understand yourself better. It's... an awakening experience. It's... community. It connects you so that everything in the world is just... a reflection of you, and you're a reflection of the world. One tiny speck of sand that makes up the whole beach and ocean--"
The'ara shook her head, bringing herself back to the present. "Sorry. I tend to wax poetic when talking about music."